Thinking of a decent, useful and thoughtful gift for your loved ones can require a lot of energy. But Chinese people don&apos;t have to worry about that during the Lunar New Year: They just give each other cash. Red packets (hong bao in Mandarin, lai see in Cantonese, or 裏in emoji) are a traditional way of expressing good wishes, appreciation and congratulations, and the Lunar New Year is one of the most important occasions for giving and receiving them. 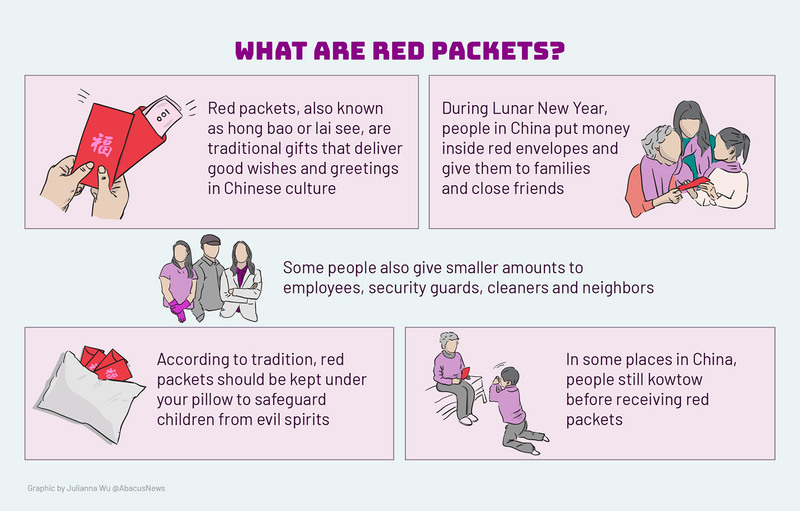 But while a physical red packet remains an essential part of the tradition, it’s been updated for the 21st century: Now instead of hand to hand, a lot of them are being given from phone to phone. 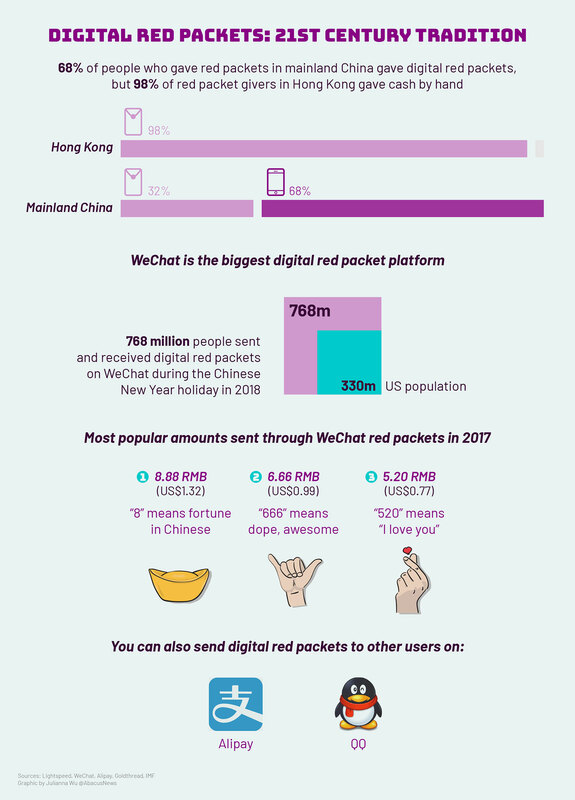 It all started in 2014, when Tencent’s WeChat launched the digital red packet function linked to WeChat Pay in January. Digital red packets tend to have smaller amounts. But a report from the Hong Kong University of Science and Technology says the amount isn’t important. “Red packet gifting in online communication is not about the monetary value, but the social messages conveyed through it, especially in groups consisting of close ties,” as the report stated. Indeed, people often send a particular amount to send a message. Numbers in Chinese sound similar to other words, like “8” can mean fortune -- so 8.88 RMB (US$1.32) is often given. Besides red packets with fixed amounts of money, WeChat also introduced a group lucky draw feature for people to use with their friends. Say one person sends a US$3 red packet to a group of five people, and can specify that they want to divide it into 3 shares with random amounts. The first three people to open will get something -- but whether they receive US$2.50, US$1 or US$0.01 is random. This new way of spreading red packets became a favorite online activity during 2014’s Lunar New Year holiday. Eight million users created and shared 40 million red packets during the holiday, according to reports. So what’s this year’s hot new feature? This year, senders can put animated stickers on digital red packets -- truly something you can’t get with paper.